I have learned that what I have not drawn, I have never really seen and that when I start drawing an ordinary thing, I realize how extraordinary it is, sheer miracle! The Basic Art Course developed from a need of a colleague to better understand the basic techniques of drawing. Often teachers find themselves in a position to teach a subject or after school activity that they know nothing about. The first Basic Art Course was squashed into a two and a half hour session for approximately 13 teachers. During this time they completed basic techniques in pencil, charcoal, pen and ink, and soft pastels. We worked fast and I tried to get as much information through in the afternoon we had. In retrospect, one afternoon cannot completely cover all the aspects. Recently, I was approached by an ex colleague to present the same Basic Art Course. It was decided to stretch the same Basic Art Course over two full days. Emphasis was placed on Foundation Phase Art in schools. Day one focused on different drawing media and day two focused on the painting aspect. The morning started with a lesson on basic shapes and how students can use basic shape recognition to assist them with their drawings. What shapes would we use to draw a fish? How would we start a drawing and finish it off. Different types of shading techniques were investigated as well as ways to ensure good compositions and tonal values. 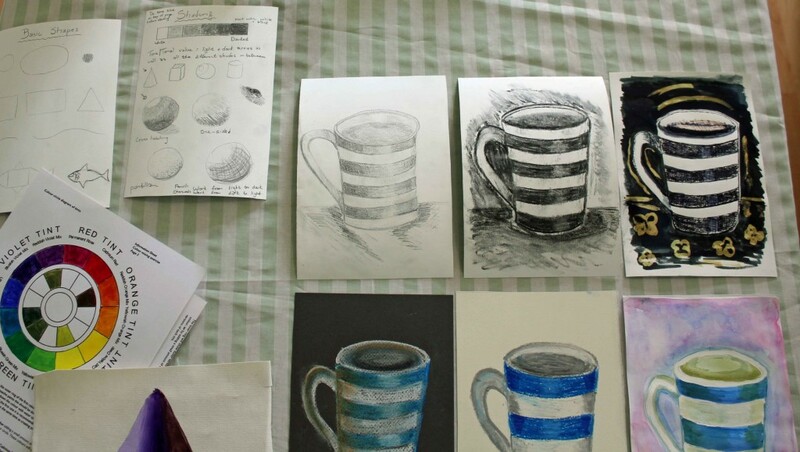 During the first half day of our two days Basic Art Course we looked at different black and white media such as pencils, charcoal and pen and ink. Focus was placed on the basic techniques as well as the different ways of drawing with these mediums. We looked at different ways to hold a pencil and utilizing your negative space to your advantage. Next in our drawing section was the colour media. The media investigated were soft and oil pastels, colour pencils and water colour paints. We experimented on different colour paper, and it was quite a mental shift from the black and white section of the Art Course. How do you use your complementary colours to add shadows instead of black? How we can keep our white areas in a water colour painting with the use of masking fluid. After a much needed rest we started our second day by painting a colour wheel. The meanings of primary, secondary and complementary colours were investigated. We mixed different types of colours and the final task was to complete a small painting. The subject was a yellow pepper on an A5 canvas. First under layers were done in acrylic paint after which oil colours were used over the acrylic paint to finish off the paintings. The end result is (as always) very surprising and wonderful to see how different people lean towards different styles. There are never two paintings that are alike, no matter how many times yellow peppers are painted. 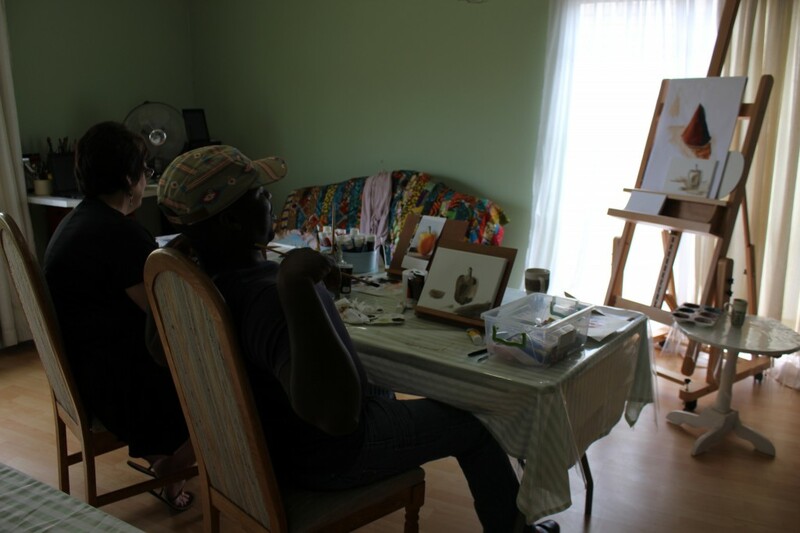 A lot of focus during this Basic Art Course was placed on positive criticism and motivation. All too often drawing is abandoned at a young age because of derogatory and negative remarks. It is always important to build a child’s self-esteem in order for them to carry on with art in the higher grades and after school. The two day Basic Art Course gave the participants enough time to fully grasp the techniques of each medium and to take the time they needed to accomplish their different drawings to a satisfactory level. It is always wonderful to work with people who are really interested in acquiring new skills and experiences.